The greenhouse is an ancient invention, going all the way back to the Roman Empire. It is the oldest example of passive solar heating, creating an environment for plants to grow in, where they otherwise couldn’t survive. Anyone who loves gardening and lives in a cold environment needs to have a greenhouse; at a minimum, to start their plants in the spring. Yet building a greenhouse is normally considered a very expensive proposition… at least, building a metal and glass one is. However, you can build your own greenhouse for a fraction of the cost and it will work pretty much just as well as one designed by an architect. This is done by using PVC pipe for the framework, covered by visqueen, a thin, sheet plastic, commonly used by building contractors to partition off areas and provide temporary weatherproofing to their projects. It is available in varying thickness up to 6 mil. Any thickness of clear visqueen will work, but the thicker variants will last longer. Before we talk about how to make the greenhouse, it would be a good idea to understand how they work. Any greenhouse is a passive solar building. So the idea is that sunlight enters through the glazed walls and roof, striking whatever is inside. Some of that sunlight is absorbed by those surfaces, turning to heat. While the glass (or plastic) structure isn’t a great insulator, it does hold that heat in, keeping the environment inside the greenhouse above freezing. With that in mind, there are a couple of key design criteria to keep in mind for any greenhouse. First of all, the greenhouse should run in an east-west direction, so that it offers the largest window area possible for the sun to come through. More sunlight will generate more heat. It is also extremely useful to have dark colors inside the greenhouse, as dark colors absorb more light, generating more heat. Dark colored mulch on the pathways will absorb more light than light colored mulch, so it will help the greenhouse work more efficiently. Adding black plastic barrels, filled with water, along the north wall of the greenhouse, will provide additional heat, as the sun striking those barrels will warm the water inside them, which in turn will radiate that heat into the greenhouse during the night. Professionally made greenhouses are usually built with double or even triple pane glass, adding considerably to their cost. But this greatly adds to the insulating value (R-value) of the greenhouse. You can approximate the same thing by using two layers of visqueen, rather than just one. Finally, greenhouses can be of any size. You can either make them to fit individual raised beds, make a small, walk-in greenhouse for starting seeds, or make a large greenhouse that covers your entire garden. The choice depends mostly on how much you can afford to spend and what sort of climate you live in. PVC provides several advantages as a building material. First of all, it’s cheap and easy to work with. Anyone can cut PVC and glue the joints together, you don’t need any carpentry experience. Another very useful characteristic of PVC is that it is flexible, allowing you to curve it to make a curved roof structure. Most PVC greenhouses are shaped in this way, using PVC to create something that looks a bit like a plastic Quonset hut. But PVC does have its weaknesses as well. Because it is so flexible, it does not provide great structural stability. This can be helped by staking the base of the greenhouse to the ground, so that the ground can keep the base from spreading. Another option is that you can greatly increase the structural strength of a PVC greenhouse by making the base and ends out of wood. The simplest PVC greenhouse is a “hoophouse” design on a single planter bed. 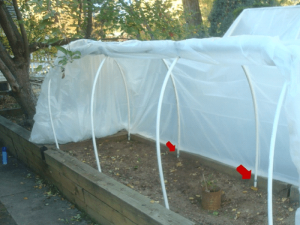 This consists of pieces of PVC pipe which are bent over the planter and attached to the sides with pipe hangers (red arrows in the photo below). Typically, 1/2 ” PVC pipe is used for this type of greenhouse. The majority of the structural strength for this greenhouse comes from the railroad ties that make up the raised planter. There is also a ridge pole (indicated by the blue arrow) which ties the bows together, preventing them from leaning sideways. The visqueen covering is only attached on the far side and the ends, making it possible to roll up the near side for working in the garden. The same basic design principle can be used for making a larger greenhouse, such as would be needed for starging seedlings. In that case, you would want something that is large enough that you could actually walk into it to do the planting and watering. As you can see, the only real difference between this greenhouse and the one above is size. To make it this big, the bows are made of two pieces of ¾” or 1” PVC pipe, joined together with standard pipe couplings. The door is made out of pipe and elbows and the door frame is made out of pipe and “T”s. the only incongruency in this design, is where the door frames meet the bow. There isn’t a T made at that particular angle, so the builder of this greenhouse modified standard parts. Since there is no planter bed to act as a base, there are sections of PVC pipe and “T”s forming the base. Three way corners are available at most home improvement centers, as people regularly use PVC to make all sorts of things. So nothing special is needed to form the corners of the greenhouse. As I mentioned before, the problem with a PVC greenhouse is that the flexibility of the PVC makes it so that it isn’t really all that strong. While the PVC bows work well to form the roof, for the long-term you need something stronger to form the foundation for the structure. This is where we need to use wood. If you are going to use wood for your greenhouse, I’d recommend using pressure-treated wood. It is actually 30% cheaper and stronger to use ¾” pressure treated plywood, cutting it into 3” strips, than it is to use pressure treated 1”x 4”s. Not only that, but I’ve had a hard time finding pressure treated lumber at my local building materials center that wasn’t warped or twisted. This greenhouse uses wood to form the base, door and door frame. That’s enough wood, when used with the PVC pipe, to ensure that the greenhouse lasts much longer and reduce the chance of it being pushed around by the wind. In this particular case, the base is made of two 2”x4” pieces, with the PVC pipe for the roof bows captured in between the two pieces. While providing a very strong base, the same could be done with less material, by using pipe hangers to attach the PVC pipe, rather than using two pieces. Being standard construction lumber, the pieces can be nailed together, without any need for special hardware. The door frame and door are made of 1”x 4”s, with overlapping corners and joints. This is extremely simple construction, while providing a lot of strength. The thin strips of wood (lath strips) you see overlaying the door and the angled braces, are there to attach the plastic. Staples through the plastic would end up pulling through, due to the wind. These prevent that from happening. 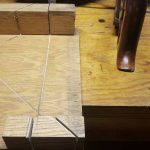 It is hard to find lath strips at most lumberyards; but you can cut your own on a table saw, ripping a 2”x 4” into ¼” thick strips. Where I live, I don’t have a problem with cold killing my plants, but rather heat and animals. Therefore, I’ve created a different sort of greenhouse for my garden. I call it a “reverse greenhouse” because rather than keeping my plants warm, it’s supposed to help keep them cool. I accomplish this by using shade cloth over the top of the structure. As you can see from the picture below, there’s no visqueen covering it. However, there’s chicken wire around the lower part, to keep the animals out. I chose not to use a hoophouse design for my greenhouse, which may have been a mistake; but this was the first one I built. I say it might have been a mistake because of cost. All the elbows, “T”s and crosses I used for making this greenhouse added quite a bit to the cost.